RBTH presents a selection of views from leading Russian media on international events, featuring analysis of the visit to Moscow by Italian Prime Minister Matteo Renzi, an update on the situation in the Donbass region of eastern Ukraine, and a report on the diverging attitudes of Europe and the U.S. over the sanctions currently in place against Russia. The Vedomosti newspaper writes that as it battles Washington for Europe, Russia is still searching for allies in the EU. 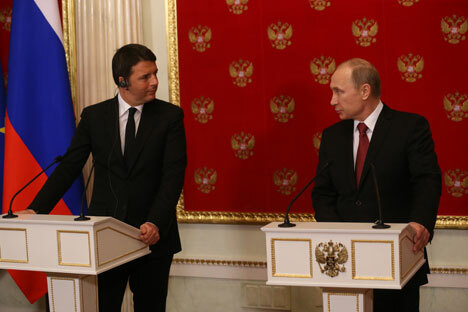 Italian Prime Minister Matteo Renzi's visit to Moscow was the first full-fledged government mission by one of the leading EU countries to the Russian capital since the beginning of the conflict in Ukraine. Vedomosti reminds its readers that earlier French President Francois Hollande had made short visits to Russia: The first time he was alone and remained just a few hours without even leaving the airport and the second time was with Angela Merkel during preparations for the meeting in Minsk on Feb. 11. Vedomosti notes that Italy is Russia's privileged partner. Rome occupies fourth place in Russia's foreign trade circuit, even though there have been losses due to the sanctions, Russian President Vladimir Putin stressed during the meeting with Renzi. Italy and Russia have stable relations that are traditionally founded on serious economic ties, Vedomosti writes, citing a report from the Stratfor analytic center. Rome also does not have any contradictions with Moscow in the geopolitical sphere, as does Berlin, for example. However, Rome would like to convince Russia to contribute to the de-escalation of the conflict in Ukraine, after which it would try to persuade the EU to cancel the sanctions against Moscow. Simultaneously, Italy would also like Russia to play a role in stabilizing the situation in Libya, according to Stratfor experts. The Kommersant newspaper reports on the upcoming meeting in Berlin between foreign ministry representatives of Ukraine, Russia, Germany and France, which will be dedicated to the realization of the Minsk Agreements signed on Feb. 12 in the Belarusian capital. The newspaper writes that the meeting was preceded by new steps aimed at de-escalating the conflict in eastern Ukraine: The talks will be held as the military confrontation in the Donbass region is fading. Kiev has announced the beginning of the second stage of heavy weaponry withdrawal. Furthermore, the weakening military confrontation is being accompanied by attempts to find a political formula that will allow the unrecognized Donetsk and Lugansk “people’s republics” (DNR and LNR) remain part of Ukraine. Kommersant explains that the self-proclaimed republics have finally demonstrated the will to come to an agreement with Kiev about the conditions for keeping the Donbass as an integral part of Ukraine. Until recently the republics' governments had firmly stated that the aim of the DNR and LNR was independence and that their existence within Ukraine was impossible under any conditions, writes Kommersant. Thus, a month after the signing of the Minsk Agreements, their implementation is yielding results. However, the U.S. and the EU are still talking about extending sanctions against Russia if the agreements are not implemented in full, notes Kommersant. Nezavisimaya Gazeta writes that this shows that Europe and the U.S. are drifting apart on the issue of pressure on Moscow. Sanctions may disrupt the negotiation process initiated by German Chancellor Angela Merkel and French President Francois Hollande. Both leaders cherish the progress reached so far, since it provides a chance for the re-establishment of normal ties between Moscow and the European capitals, underlines the publication. However, there are still advocates of a tougher stance on Russia in Europe: The UK still supports the U.S. As proof Nezavisimaya Gazeta cites British Defense Secretary Michael Fallon, who said that Russia's threat to Europe is as big as that posed by the Islamic State radical militant group (ISIS).